It’s Howdy Doodie Time; It’s Snarky Friday Time; The football season’s here; so let’s all stand and cheer. For any freshmen (and women) to HWIT, Fridays and Mondays are dedicated to college football. I write about teams I like and teams that play teams I like. Football fans got a little taste last night. First to the Oklahoma State Cowboys Granted you did not play a power house hosting Tulsa, but Pistol Pete and the team looked pretty sharp. I have been to Daddy Boone Stadium in Stillwater. They play this video clip with Kurt Russell and then scream “and we’re coming with it when the Oklahoma State logo appears.” They might just be doing it this year. Since the Oklahoma State game was over at the end of the first quarter, I turned to the Ohio State/Indiana game. Monday is the official day of awards, but I must give Ohio State University the first 2017 Poopie Undies Award. The Buckeyes really looked like #2 in the first half and I am not referring to their ranking. Wonder what Urban said at halftime? when THE University of Texas plays Maryland on FS1 @ 11: 00. The Maryland school mascot is an anthropomorphic (means it ain’t a real animal) turtle named “Testudo.” The official team colors are red, white, black, and gold, derived from the Maryland state flag. This usually results in a disastrous uniform combination, but we shall see. This game is opposite the Oklahoma University Sooners and the University of Texas @ El Paso Miners on Fox. I hate 11:00 games. Note to self: stock up on bloody Mary supplies. There are games throughout the day on Saturday but we are waiting for night fall. At 6:00 on FSports 2 we find the Baylor Bears opening against Liberty Flames. The Baylor team is the Bears and the Liberty teams is the Flames. The mascot of Baylor is a bear. The mascot of Liberty is anthropomorphic (means it ain’t a real animal.) eagle named Sparky. This is a reminder to my Tide Rolling Friends to be sure to have an adequate supply of alcohol, antacids and smelling salts. Text me if you need assistance controlling your breathing. ROLL TIDE. On the third screen of my house, coming to you from New Orleans, Louisiana, thanks to Harvey, we have a game of two cats when LSU meets BYU. This is your annual reminder that BYU’s mascot is a Cougar. They are not the BYU Mormons. Sunday brings two games of special interest since I have papers on the wall from both schools. At 6:30 on Fox Sports the Fighting Texas Aggies meet the UCLA Bruins in the Rose Bowl. Note to self: double liquor store order. Texas doesn’t sell liquor on Sunday. This game will determine which head coach has the hottest seat next week. At 7:00 on ESPNU Sam Houston State plays Richmond University. Thank you Baylor nation for allowing the game to be held in McLane Stadium. Did you know that Richmond is the only NCAA school whose mascot is a spider. The spider’s name is WebstUR. I hope the mascot is also anthropomorphic. Look on the scoreboard and see who’s a winning! BTHO UCLA – Gig’ Em Aggies! 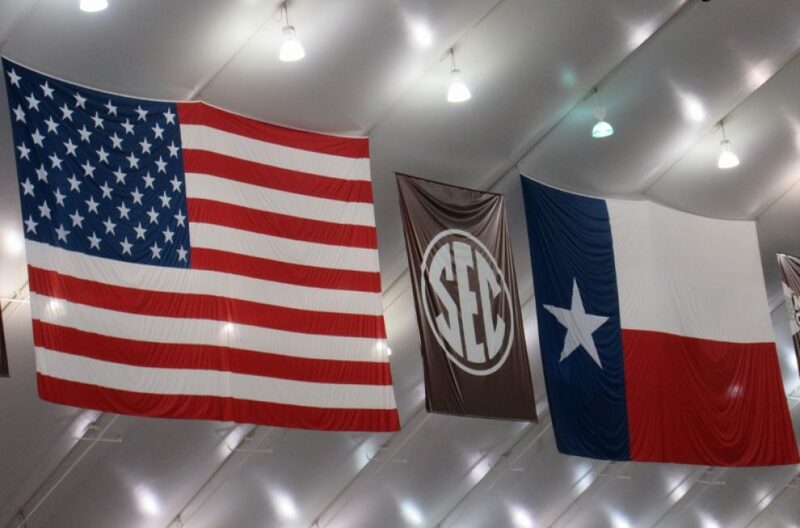 This entry was posted in Alabama, Coach Kevin Sumlin, Coach Nick Saban, College Football, college football, Education, humor, LSU, Misc., Native Texan, Texas Aggies. Bookmark the permalink. How stoopid is it to schedule a football game at 11:00 a.m. In Texas? So glad we gave up our season tickets – cheaper and cooler!